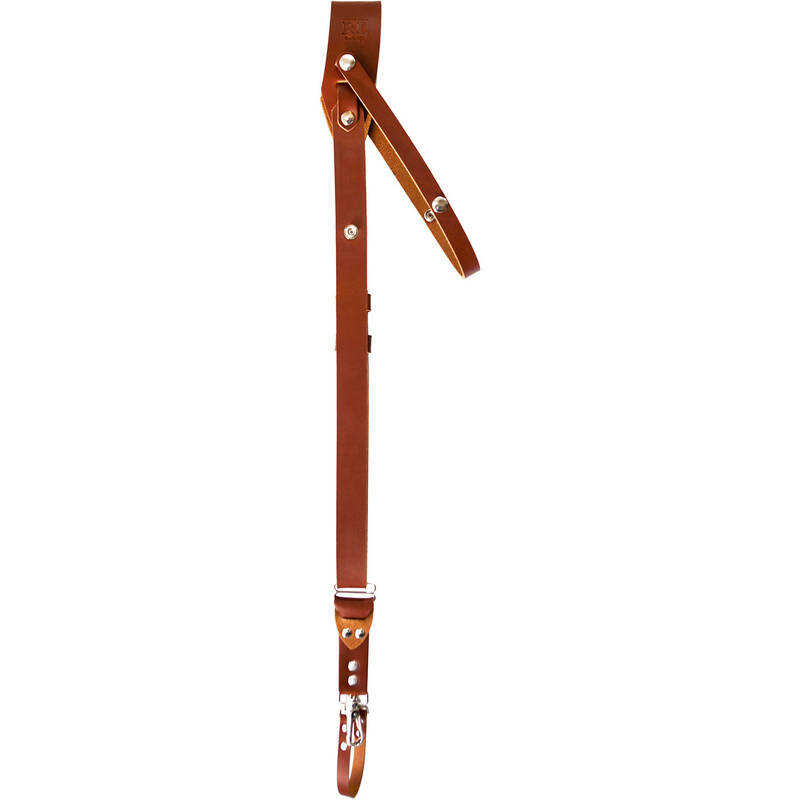 Carry your DSLR or mirrorless camera and attached lens with the handcrafted, made in the USA, medium tan Andino Pro Single Leather Camera Sling from RL Handcrafts. Photographers will appreciate the quick-access camera glide system. Genuine leather combined with stitched and waxed edges, and nickel-plated brass hardware ensure strength, looks, and durability. For comfort and stability, the sling has an integrated stabilizer, and button adjustments for a custom fit. A security strap is included. To put on the strap, grab one side and slip it through one arm, and then the other arm. Then, pull down on both harnesses and the pivot points will self adjust to your body. The hook that attaches to the camera should be at waist level. For optimal performance and comfort, the right and left straps, behind your back, can be adjusted. The extra security strap can be attached to the left or right rings on either side of your camera. The camera will rest on the side of your body and be easily accessible as it glides up and down the strap from your waist to your desired shooting position. The Andino Pro Single Leather Camera Sling is available in several sizes. To ensure optimal fit with RL Handcrafts camera straps, follow the chest and height specifications. Measurements should be taken by measuring around your chest. Defer to the next size up or down based on height differences.